Kuwait's government is a constitutional monarchy headed by the hereditary leader, the emir. The Kuwaiti emir is a member of the Al Sabah family, which has ruled the country since 1938; the current monarch is Sabah Al-Ahmad Al-Jaber Al-Sabah. The capital of Kuwait is Kuwait City, with a population 151,000 and with a metro area population of 2.38 million. According to the US Central Intelligence Agency, the total population of Kuwait is about 2.695 million, which includes 1.3 million non-nationals. Kuwait's government, however, maintains that there are 3.9 million people in Kuwait, of whom 1.2 million are Kuwaiti. Among the actual Kuwaiti citizens, approximately 90% are Arabs and 8% are of Persian (Iranian) descent. There are also a small number of Kuwaiti citizens whose ancestors came from India. Within the guest worker and expatriate communities, Indians make up the largest group at nearly 600,000. There are an estimated 260,000 workers from Egypt, and 250,000 from Pakistan. Other foreign nationals in Kuwait include Syrians, Iranians, Palestinians, Turks, and smaller numbers of Americans and Europeans. Kuwait's official language is Arabic. Many Kuwaitis speak the local dialect of Arabic, which is an amalgam of Mesopotamian Arabic of the southern Euphrates branch, and Peninsular Arabic, which is the variant most common on the Arabian Peninsula. Kuwaiti Arabic also includes many loan words from Indian languages and from English. English is the most commonly used foreign language for business and commerce. Islam is the official religion of Kuwait. Approximately 85% of Kuwaitis are Muslim; of that number, 70% are Sunni and 30% are Shi'a, mostly of the Twelver school. Kuwait has tiny minorities of other religions among its citizens, as well. There are about 400 Christian Kuwaitis, and about 20 Kuwaiti Baha'is. Among the guest workers and ex-pats, approximately 600,000 are Hindu, 450,000 are Christian, 100,000 are Buddhist, and about 10,000 are Sikhs. The remainder are Muslim. Because they are People of the Book, Christians in Kuwait are allowed to build churches and keep a certain number of clergy, but proselytizing is forbidden. Hindus, Sikhs, and Buddhists are not allowed to build temples or gurdwaras. Kuwait is a small country, with an area of 17,818 sq km (6,880 sq miles); in comparative terms, it is slightly smaller than the island nation of Fiji. Kuwait has about 500 kilometers (310 miles) of coastline along the Persian Gulf. It borders on Iraq to the north and west, and Saudi Arabia to the south. The Kuwaiti landscape is a flat desert plain. Only 0.28% of the land is planted in permanent crops, in this case, date palms. The country has a total of 86 square miles of irrigated cropland. Kuwait's highest point doesn't have any particular name, but it stands 306 meters (1,004 feet) above sea level. Kuwait's climate is a desert one, characterized by hot summer temperatures, a short, cool winter, and minimal rainfall. Annual rainfall averages between 75 and 150 mm (2.95 to 5.9 inches). Average high temperatures in the summer are a toasty 42 to 48°C (107.6 to 118.4°F). The all-time high, recorded on July 31, 2012, was 53.8°C (128.8°F), measured at Sulaibya. This is also the record high for the entire Middle East. March and April often witness large dust storms, which sweep in on the northwesterly winds from Iraq. Thunderstorms also accompany the winter rains in November and December. Kuwait is the fifth richest country on Earth, with a GDP of $165.8 billion US, or $42,100 US per capita. Its economy is based primarily on petroleum exports, with the major recipients being Japan, India, South Korea, Singapore, and China. 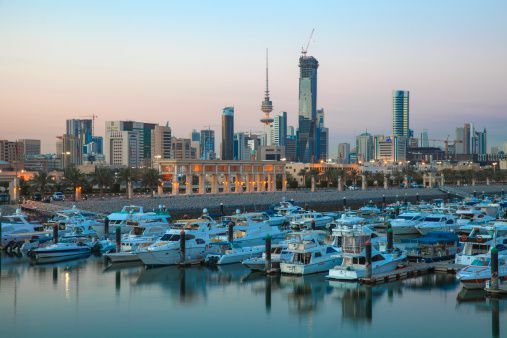 Kuwait also produces fertilizers and other petrochemicals, engages in financial services, and maintains an ancient tradition of pearl diving in the Persian Gulf. Kuwait imports almost all of its food, as well as most products from clothing to machinery. Kuwait's economy is quite free, compared with its Middle Eastern neighbors. The government is hoping to encourage the tourism and regional trade sectors to reduce the country's dependence on oil exports for income. Kuwait has known oil reserves of about 102 billion barrels. The unemployment rate is 3.4% (2011 estimate). The government does not release figures for percent of the population living in poverty. The country's currency is the Kuwaiti dinar. As of March 2014, 1 Kuwaiti dinar = $3.55 US. During ancient history, the area that is now Kuwait was often a hinterland of more powerful neighboring areas. It was linked with Mesopotamia as early as the Ubaid era, beginning roughly 6,500 BCE, and with Sumer around 2,000 BCE. In the interim, between about 4,000 and 2,000 BCE, a local empire called the Dilmun Civilization controlled the bay of Kuwait, from which it directed trade between Mesopotamia and the Indus Valley civilization in what is now Pakistan. After Dilmun collapsed, Kuwait became part of the Babylonian Empire around 600 BCE. Four hundred years later, the Greeks under Alexander the Great colonized the area. The Sassanid Empire of Persia conquered Kuwait in 224 CE. In 636 CE, the Sassanids fought and lost the Battle of Chains in Kuwait, against the armies of a new faith that had arisen on the Arabian Peninsula. It was the first move in Islam's rapid expansion in Asia. Under the caliphs' rule, Kuwait once again became a major trading port connected to the Indian Ocean trade routes. When the Portuguese muscled their way into the Indian Ocean in the fifteenth century, they seized a number of trading ports including the bay of Kuwait. Meanwhile, the Bani Khalid clan founded what is now Kuwait City in 1613, as a series of small fishing villages. Soon Kuwait was not only a major trade hub but also a legendary fishing and pearl diving site. It traded with various parts of the Ottoman Empire in the 18th century and became a shipbuilding center. In 1775, the Zand Dynasty of Persia laid siege to Basra (in coastal southern Iraq) and occupied the city. This lasted until 1779 and greatly benefited Kuwait, as all of Basra's trade got diverted to Kuwait instead. Once the Persians withdrew, the Ottomans appointed a governor for Basra, who also administered Kuwait. In 1896, tensions between Basra and Kuwait reached a peak, when the sheik of Kuwait accused his brother, the emir of Iraq, of seeking to annex Kuwait. In January 1899, the Kuwaiti sheik, Mubarak the Great, made an agreement with the British under which Kuwait became an informal British protectorate, with Britain controlling its foreign policy. In exchange, Britain held off both the Ottomans and the Germans from interfering in Kuwait. However, in 1913, Britain signed the Anglo-Ottoman Convention just before the outbreak of World War I, which defined Kuwait as an autonomous region within the Ottoman Empire, and the Kuwaiti sheiks as Ottoman sub-governors. Kuwait's economy went into a tailspin in the 1920s and 1930s. However, oil was discovered in 1938, with its promise of future petrol-riches. First, however, Britain took direct control of Kuwait and Iraq on June 22, 1941, as World War II erupted in its full fury. Kuwait would not gain full independence from the British until June 19, 1961. During the Iran/Iraq War of 1980-88, Kuwait supplied Iraq with massive amounts of aid, fearful of Iran's influence after the Islamic Revolution of 1979. In retaliation, Iran attacked Kuwaiti oil tankers, until the US Navy intervened. Despite this earlier support for Iraq, on August 2, 1990, Saddam Hussein ordered the invasion and annexation of Kuwait. Iraq claimed that Kuwait was actually a rogue Iraqi province; in response, a US-led coalition launched the First Gulf War and ousted Iraq. Retreating Iraqi troops took revenge by setting fire to Kuwait's oil wells, creating enormous environmental problems. The emir and the Kuwaiti government returned to Kuwait City in March of 1991 and instituted unprecedented political reforms, including parliamentary elections in 1992. Kuwait also served as the launchpad for the US-led invasion of Iraq in March of 2003, at the start of the Second Gulf War.